This document explains the basic communications design and messaging specification for how the various IPython objects interact over a network transport. The current implementation uses the ZeroMQ library for messaging within and between hosts. This document should be considered the authoritative description of the IPython messaging protocol, and all developers are strongly encouraged to keep it updated as the implementation evolves, so that we have a single common reference for all protocol details. stdin: this ROUTER socket is connected to all frontends, and it allows the kernel to request input from the active frontend when raw_input() is called. The frontend that executed the code has a DEALER socket that acts as a ‘virtual keyboard’ for the kernel while this communication is happening (illustrated in the figure by the black outline around the central keyboard). In practice, frontends may display such kernel requests using a special input widget or otherwise indicating that the user is to type input for the kernel instead of normal commands in the frontend. Shell: this single ROUTER socket allows multiple incoming connections from frontends, and this is the socket where requests for code execution, object information, prompts, etc. are made to the kernel by any frontend. The communication on this socket is a sequence of request/reply actions from each frontend and the kernel. IOPub: this socket is the ‘broadcast channel’ where the kernel publishes all side effects (stdout, stderr, etc.) as well as the requests coming from any client over the shell socket and its own requests on the stdin socket. There are a number of actions in Python which generate side effects: print() writes to sys.stdout, errors generate tracebacks, etc. Additionally, in a multi-client scenario, we want all frontends to be able to know what each other has sent to the kernel (this can be useful in collaborative scenarios, for example). This socket allows both side effects and the information about communications taking place with one client over the shell channel to be made available to all clients in a uniform manner. All messages are tagged with enough information (details below) for clients to know which messages come from their own interaction with the kernel and which ones are from other clients, so they can display each type appropriately. The actual format of the messages allowed on each of these channels is specified below. Messages are dicts of dicts with string keys and values that are reasonably representable in JSON. Our current implementation uses JSON explicitly as its message format, but this shouldn’t be considered a permanent feature. As we’ve discovered that JSON has non-trivial performance issues due to excessive copying, we may in the future move to a pure pickle-based raw message format. However, it should be possible to easily convert from the raw objects to JSON, since we may have non-python clients (e.g. a web frontend). As long as it’s easy to make a JSON version of the objects that is a faithful representation of all the data, we can communicate with such clients. Not all of these have yet been fully fleshed out, but the key ones are, see kernel and frontend files for actual implementation details. # messages in a meaningful way. # All recognized message type strings are listed below. # clients can track where messages come from. # depends on the message type. As messages are dicts, they map naturally to a func(**kw) call form. We should develop, at a few key points, functional forms of all the requests that take arguments in this manner and automatically construct the necessary dict for sending. # but the Python implementation copies them to the top level. All messages sent to or received by any IPython process should have this extended structure. This message type is used by frontends to ask the kernel to execute code on behalf of the user, in a namespace reserved to the user’s variables (and thus separate from the kernel’s own internal code and variables). # Source code to be executed by the kernel, one or more lines. # The default is False. # returns is a JSON string of the variable's repr(), not a python object. # StdinNotImplementedError will be raised. The code field contains a single string (possibly multiline). The kernel is responsible for splitting this into one or more independent execution blocks and deciding whether to compile these in ‘single’ or ‘exec’ mode (see below for detailed execution semantics). The user_ fields deserve a detailed explanation. In the past, IPython had the notion of a prompt string that allowed arbitrary code to be evaluated, and this was put to good use by many in creating prompts that displayed system status, path information, and even more esoteric uses like remote instrument status aqcuired over the network. But now that IPython has a clean separation between the kernel and the clients, the kernel has no prompt knowledge; prompts are a frontend-side feature, and it should be even possible for different frontends to display different prompts while interacting with the same kernel. user_variables: If only variables from the user’s namespace are needed, a list of variable names can be passed and a dict with these names as keys and their repr() as values will be returned. user_expressions: For more complex expressions that require function evaluations, a dict can be provided with string keys and arbitrary python expressions as values. The return message will contain also a dict with the same keys and the repr() of the evaluated expressions as value. With this information, frontends can display any status information they wish in the form that best suits each frontend (a status line, a popup, inline for a terminal, etc). In order to obtain the current execution counter for the purposes of displaying input prompts, frontends simply make an execution request with an empty code string and silent=True. Execute the code field, see below for details. If #2 succeeds, compute user_variables and user_expressions are computed. This ensures that any error in the latter don’t harm the main code execution. Call any method registered with register_post_execute(). The API for running code before/after the main code block is likely to change soon. Both the pre_runcode_hook and the register_post_execute() are susceptible to modification, as we find a consistent model for both. An arbitrary amount of source code, this is how modules are compiled. sys.displayhook() is never implicitly called. A single expression that returns a value. sys.displayhook() is never implicitly called. If there is only a single block: it is executed in ‘single’ mode. if the last one is a single line long, run all but the last in ‘exec’ mode and the very last one in ‘single’ mode. This makes it easy to type simple expressions at the end to see computed values. otherwise (last one is also multiline), run all in ‘exec’ mode as a single unit. The user can simply send the same variable name or expression for evaluation to see a regular traceback. Errors in any registered post_execute functions are also reported similarly, and the failing function is removed from the post_execution set so that it does not continue triggering failures. Upon completion of the execution request, the kernel always sends a reply, with a status code indicating what happened and additional data depending on the outcome. See below for the possible return codes and associated data. The kernel has a single, monotonically increasing counter of all execution requests that are made with silent=False. This counter is used to populate the In[n], Out[n] and _n variables, so clients will likely want to display it in some form to the user, which will typically (but not necessarily) be done in the prompts. The value of this counter will be returned as the execution_count field of all execute_reply messages. # be the current value of the counter in the kernel. # 'payload' will be a list of payload dicts. # action on it as needed. See main text for further details. # Results for the user_variables and user_expressions. which appends a dictionary to the list of payloads. When status is ‘abort’, there are for now no additional data fields. This happens when the kernel was interrupted by a signal. This part of the messaging spec is not actually implemented in the kernel yet. While this protocol does not specify full RPC access to arbitrary methods of the kernel object, the kernel does allow read (and in some cases write) access to certain attributes. The policy for which attributes can be read is: any attribute of the kernel, or its sub-objects, that belongs to a Configurable object and has been declared at the class-level with Traits validation, is in principle accessible as long as its name does not begin with a leading underscore. The attribute itself will have metadata indicating whether it allows remote read and/or write access. The message spec follows for attribute read and write requests. AttributeError: this type of error was raised when trying to access the given name by the kernel itself. This means that the attribute likely doesn’t exist. AccessError: the attribute exists but its value is not readable remotely. # One of ['ok', 'AttributeError', 'AccessError']. # If status is 'ok', a JSON object. When a setattr_request fails, there are also two possible error types with similar meanings as those of the getattr_request case, but for writing. One of IPython’s most used capabilities is the introspection of Python objects in the user’s namespace, typically invoked via the ? and ?? characters (which in reality are shorthands for the %pinfo magic). This is used often enough that it warrants an explicit message type, especially because frontends may want to get object information in response to user keystrokes (like Tab or F1) besides from the user explicitly typing code like x??. # 'x?' at the prompt, 1 is equivalent to 'x??'. The returned information will be a dictionary with keys very similar to the field names that IPython prints at the terminal. # it's false, all other fields will be empty. # compose it are also returned as the argspec field. # objects, this field is empty. # and class docstrings as well, if available. # that no source was found. # The position of the cursor where the user hit 'TAB' on the line. # ['a.isalnum', 'a.isalpha'] for the above example. For clients to explicitly request history from a kernel. The kernel has all the actual execution history stored in a single location, so clients can request it from the kernel when needed. # If True, also return output history in the resulting dict. # If True, return the raw input history, else the transformed input. # So far, this can be 'range', 'tail' or 'search'. # start and stop are line numbers within that session. # If hist_access_type is 'tail', get the last n cells. # pattern (with * and ? as wildcards). # depending on whether output was False or True, respectively. When a client connects to the request/reply socket of the kernel, it can issue a connect request to get basic information about the kernel, such as the ports the other ZeroMQ sockets are listening on. This allows clients to only have to know about a single port (the shell channel) to connect to a kernel. 'shell_port' : int  # The port the shell ROUTER socket is listening on. 'iopub_port' : int   # The port the PUB socket is listening on. 'stdin_port' : int   # The port the stdin ROUTER socket is listening on. 'hb_port' : int    # The port the heartbeat socket is listening on. when the user chooses to close the client application via a menu or window control. when the user types ‘exit’ or ‘quit’ (or their uppercase magic equivalents). when the user chooses a GUI method (like the ‘Ctrl-C’ shortcut in the IPythonQt client) to force a kernel restart to get a clean kernel without losing client-side state like history or inlined figures. The client sends a shutdown request to the kernel, and once it receives the reply message (which is otherwise empty), it can assume that the kernel has completed shutdown safely. Upon their own shutdown, client applications will typically execute a last minute sanity check and forcefully terminate any kernel that is still alive, to avoid leaving stray processes in the user’s machine. For both shutdown request and reply, there is no actual content that needs to be sent, so the content dict is empty. When the clients detect a dead kernel thanks to inactivity on the heartbeat socket, they simply send a forceful process termination signal, since a dead process is unlikely to respond in any useful way to messages. 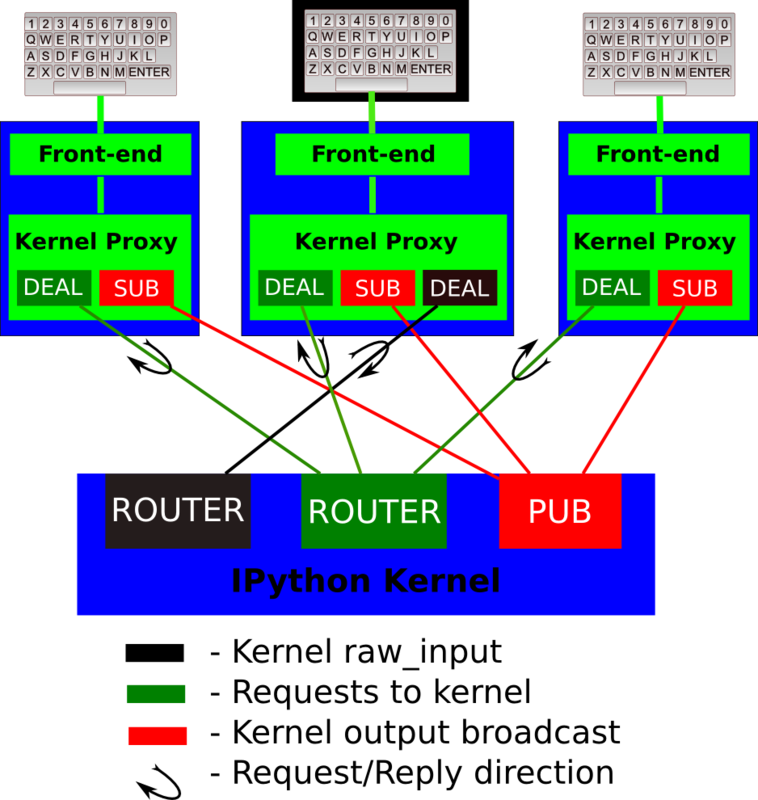 When a kernel receives a raw_input call, it should also broadcast it on the pub socket with the names ‘stdin’ and ‘stdin_reply’. This will allow other clients to monitor/display kernel interactions and possibly replay them to their user or otherwise expose them. This type of message is used to bring back data that should be diplayed (text, html, svg, etc.) in the frontends. This data is published to all frontends. Each message can have multiple representations of the data; it is up to the frontend to decide which to use and how. A single message should contain all possible representations of the same information. Each representation should be a JSON’able data structure, and should be a valid MIME type. Do we use this message type for pyout/displayhook? Probably not, because the displayhook also has to handle the Out prompt display. On the other hand we could put that information into the metadata secion. # MIME type which is used as a backup representation. These messages are the re-broadcast of the execute_request. # (for input prompt In[N]). When Python produces output from code that has been compiled in with the ‘single’ flag to compile(), any expression that produces a value (such as 1+1) is passed to sys.displayhook, which is a callable that can do with this value whatever it wants. The default behavior of sys.displayhook in the Python interactive prompt is to print to sys.stdout the repr() of the value as long as it is not None (which isn’t printed at all). In our case, the kernel instantiates as sys.displayhook an object which has similar behavior, but which instead of printing to stdout, broadcasts these values as pyout messages for clients to display appropriately. IPython’s displayhook can handle multiple simultaneous formats depending on its configuration. The default pretty-printed repr text is always given with the data entry in this message. Any other formats are provided in the extra_formats list. Frontends are free to display any or all of these according to its capabilities. extra_formats list contains 3-tuples of an ID string, a type string, and the data. The ID is unique to the formatter implementation that created the data. Frontends will typically ignore the ID unless if it has requested a particular formatter. The type string tells the frontend how to interpret the data. It is often, but not always a MIME type. Frontends should ignore types that it does not understand. The data itself is any JSON object and depends on the format. It is often, but not always a string. # except the 'status' field is omitted. This message type is used by frontends to monitor the status of the kernel. # state and when it finishes, it will enter the 'idle' state. When the kernel has an unexpected exception, caught by the last-resort sys.excepthook, we should broadcast the crash handler’s output before exiting. This will allow clients to notice that a kernel died, inform the user and propose further actions. # contain ename, etype and traceback fields. Other potential message types, currently unimplemented, listed below as ideas. This is a socket where the request/reply pattern goes in the opposite direction: from the kernel to a single frontend, and its purpose is to allow raw_input and similar operations that read from sys.stdin on the kernel to be fulfilled by the client. The request should be made to the frontend that made the execution request that prompted raw_input to be called. For now we will keep these messages as simple as possible, since they only mean to convey the raw_input(prompt) call. We do not explicitly try to forward the raw sys.stdin object, because in practice the kernel should behave like an interactive program. When a program is opened on the console, the keyboard effectively takes over the stdin file descriptor, and it can’t be used for raw reading anymore. Since the IPython kernel effectively behaves like a console program (albeit one whose “keyboard” is actually living in a separate process and transported over the zmq connection), raw stdin isn’t expected to be available. Initially we had considered using messages like those above over ZMQ for a kernel ‘heartbeat’ (a way to detect quickly and reliably whether a kernel is alive at all, even if it may be busy executing user code). But this has the problem that if the kernel is locked inside extension code, it wouldn’t execute the python heartbeat code. But it turns out that we can implement a basic heartbeat with pure ZMQ, without using any Python messaging at all. The monitor sends out a single zmq message (right now, it is a str of the monitor’s lifetime in seconds), and gets the same message right back, prefixed with the zmq identity of the DEALER socket in the heartbeat process. This can be a uuid, or even a full message, but there doesn’t seem to be a need for packing up a message when the sender and receiver are the exact same Python object. where the first part is the zmq.IDENTITY of the heart’s DEALER on the engine, and the rest is the message sent by the monitor. No Python code ever has any access to the message between the monitor’s send, and the monitor’s recv. Important: finish thinking through the payload concept and API. Important: ensure that we have a good solution for magics like %edit. It’s likely that with the payload concept we can build a full solution, but not 100% clear yet. Finishing the details of the heartbeat protocol. Signal handling: specify what kind of information kernel should broadcast (or not) when it receives signals. © Copyright 2008, The IPython Development Team. Last updated on Apr 05, 2013. Created using Sphinx 1.1.3.